Cross Reference Files are used to reduce the server and network load when processing large amounts of data. Sometimes, these cross references get out of sync. If this has happened, you might notice that availability is out of sync, displayed names don't match the names of guests or information seems to be missing. One solution is to rebuild these Cross Reference Files. Before running this utility, have all PMS users stop what they're doing and exit out of any guest folios or reservations. After selecting this option you'll see a small window with a field to type a program name. This is where you type "GANXREF". After typing "GANXREF" in the field click OK. You'll be asked to select a printer and you should select the first one in the list. 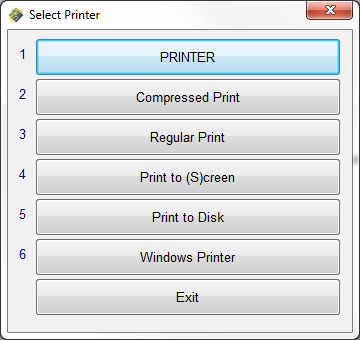 Nothing will be printed but you must select a printer to continue. 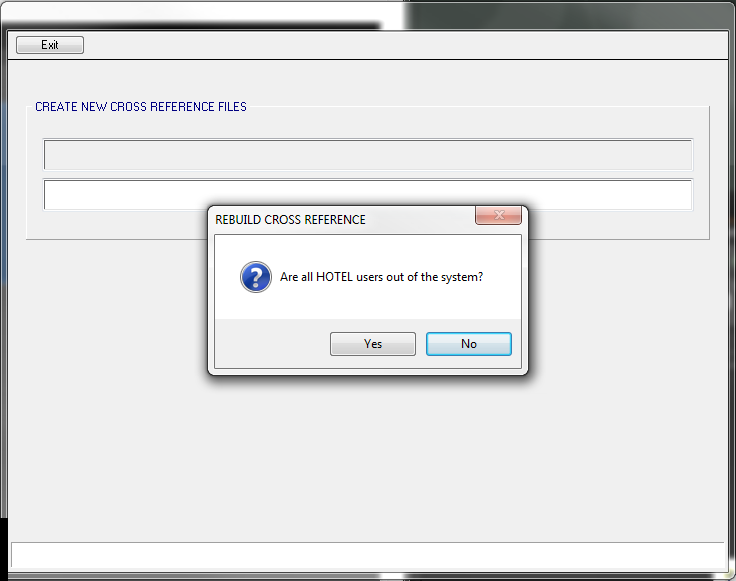 After selecting the printer you'll see the Cross Reference Rebuild utility. To continue, you should get all other users out of the PMS software. If anyone remains in a guest folio, reservation, or is trying to do anything in the PMS software, either the rebuild or the other user could lock up. After verifying that all other users are out of the software, click Yes to the question "Are all HOTEL users out of the system?" Please note that this does not refer to you, because you are the one running the rebuild. This also doesn't apply to any Point of Sale or Execu/Suite Activities users. After clicking Yes, you will see a number of things moving on the screen. Sometimes it progresses too fast to see what it's doing, but as long as you see movement, it's running. If you have some very large databases, or large folios, it might seem to pause for several minutes while it's being processed. Your Night Auditor should be able to provide a reasonable estimate for the time it takes this utility to run, since it runs during the Night Audit Reorganize. At the end of the rebuild, you may see a window asking "Rebuild profile keys?" Click No unless Execu/Tech Support as instructed you to click Yes. This can be a lengthy and almost always unnecessary step. 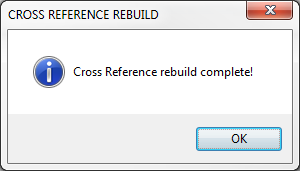 You should see a window telling you "Cross Reference rebuild complete!" After click OK, you might be asked to log in, again. Check to see if this has solved your problem. If not, you should contact Execu/Tech Support for further instructions and troubleshooting.